I was interested to read in our local paper this morning that the town council has issued a request to motorists to take more care in parking in the older parts of the town with very narrow streets. The available road is then often less than 3.20m wide. Emergency vehicles and the like it would appear, are having problems getting past vehicles parked opposite each other. In addition because of this problem of narrow streets, parking with two wheels on pavements (sidewalks) is tolerated, but motorists are supposed to leave a 1m gap between the car and the wall to allow pensioners with wheeled Zimmer frames, wheelchairs, pram pushing mums and children under eight on bicycles to pass without hindrance. Children under eight must use the pavement by law. This gap of 1m is often ignored. At the moment these children are forced out into the road. The town council requests parents, teachers etc. make the law clear to any motorist they find parking so that the pavement is blocked. This might however lead to unpleasant scenes. German motorists are not amused when one points out that they are wrongly parked. 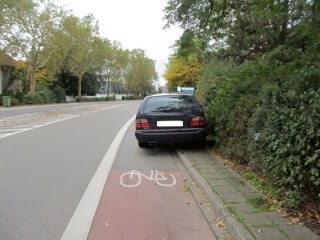 In addition cycleways are often regarded as a parking place. I suspect a campaign by the town's parking wardens issuing tickets would be more effective. Even though it might well be political suicide for any council taking this course of action.